January 2018 will see the Clipper Round Yacht Race fleet arrive at Abell Point Marina and be welcomed on the dock in true Whitsundays style. To celebrate this incredible yachting event choosing the Whitsundays has the Host Port, two weeks of wondrous events are scheduled for 13 – 29 January. If ever there was a time to stay, play, explore in the Whitsundays, then this is it. Hosted in Airlie Beach along the foreshore, enjoy live music, great food, night markets, an introduction to the Clipper Crews and an incredible firework display. The event is free entry and all ages are welcome. Join us in welcoming the Clipper Crews to our tropical paradise. 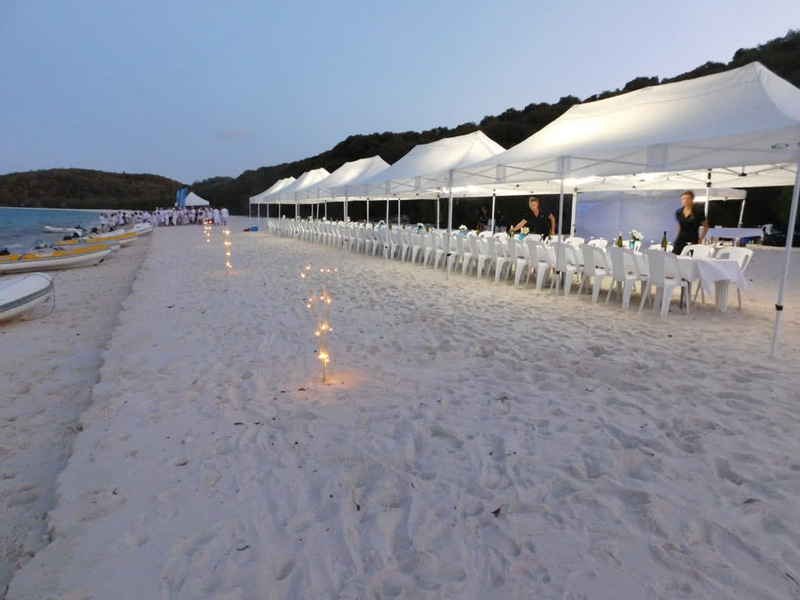 Imagine toes in the soft white sand, sipping on a glass of bubbles as you feast on a seafood smorgasbord. All this on the country’s most iconic beach – Whitehaven. Cruise over via ferry, enjoy a sumptuous long lunch under the shade of a marquee with like-minded foodies. A bucket list experience. Showcasing some of the regions finest venues, the progressive lunch starts with canapes and champers at Hemingway’s restaurant, then be taken via ferry to the private Paradise Cove Resort where you will enjoy a buffet lunch on the lawn. After lunch head to Cape Gloucester Eco Resort at Hideaway Bay where the dessert course will be served as you relax in the resort atmosphere and enjoy some pool time. Suitable for all ages, this will be a great regional experience. Join the cowboys for some thrilling bull ride action at the Rodeo By the Reef. Live music, BBQ by the Reef competition through Australian BBQ Alliance, post Rodeo party at the Grand View Hotel. For all things country on the foreshore at Bowen, this is the event for you. The Clipper fleet will be open to the public for viewing at Abell Point Marina. In addition, the Clipperdome will provide a range of interactive displays which will tell you everything you need to know about the Clipper Round World Yacht Race. Get up close and personal with the crew and enjoy the vibrant village atmosphere of Abell Point Marina. Watch the spectacle from the shore or your own boat as the fleet departs for the Asia leg of the race, to Sanya in China. The parade of sail will take place in Pioneer Bay before the yachts turn north and head up the east coast before departing Australian shores. Join us at the carnival! Click here for all the up to date information and to book tickets for the events here.